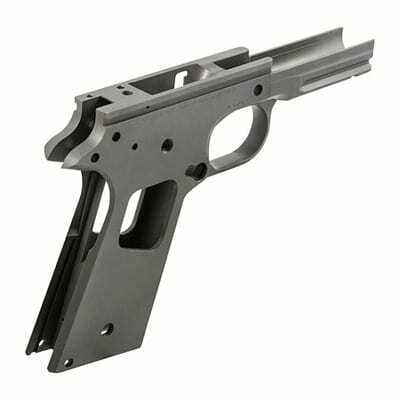 Maybe you’re building a new 1911, or your current firearm is in dire need of an upgrade of its skeleton: the frame. Whatever your need, we can help find you the best 1911 frames on the market that are also affordable enough to not break the bank. We’ll explain everything there is to know about 1911 frames and how you can tell good picks from wastes of time. When it comes to 1911 frames, you can decide to do two things with them; start a new 1911 build or upgrade your existing firearm. Both options have advantages and disadvantages, but you’ll have to decide for yourself which of the two is more convenient for you. If you choose to upgrade your 1911 frame, right off the bat you can expect a decent amount of work. Because of the complicated process surrounding such an in-depth change to your firearm’s characteristics, you should visit a gunsmith if you’re not totally confident in your workshop and smithing skills yourself. In addition, an upgrade may require different parts than are currently integrated with your original 1911. Therefore, it’s important that you make sure you have all the springs, screws, and smaller pieces you might need before enacting an upgrade. 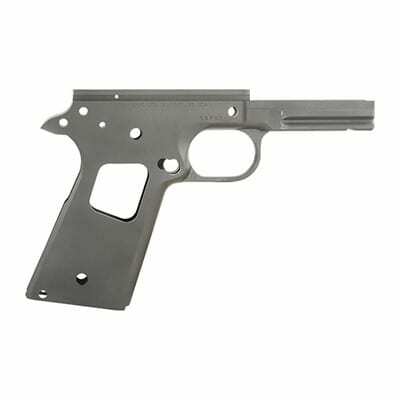 You may need to buy a 1911 parts kit in addition to a totally new 1911 frame. On the other hand, you can build a new 1911. While this will likely be more expensive overall than simply upgrading the frame, you’ll be able to make sure that everything works smoothly and add customizations and additions in the process of the build. 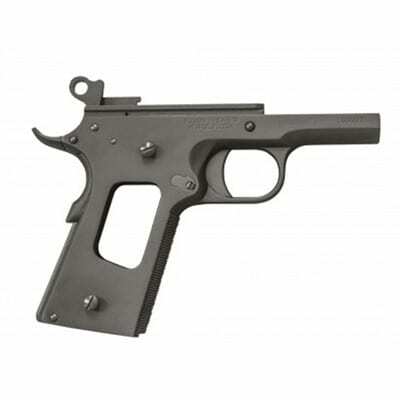 This might be a more worthwhile choice if your 1911’s other aspects, such as the slide or barrel, need replacing soon anyway. You can sometimes save time by building an entirely new firearm. Before we look at our favorite 1911 frames for the money, let’s examine some critical factors to keep in mind as we shop. These are aspects that will directly affect the 1911’s performance, so they’re important to remember. Most frames are made from some kind of steel metal, such as stainless steel. However, you might want one with a different kind of material build, so check to see what each offering advertises. Certain frames have titanium or aluminum compositions to change weight or balance. You should also make sure that whatever material you choose works with your existing pieces if you’re upgrading. This is a personal preference, but most people like their weapons to look good. Double check the color before you buy so that it meshes with the rest of the 1911 parts. In this way, you’ll end up with a cohesive, good-looking gun instead of a cobbled-together custom job that’s kind of janky in appearance. This refers to the machined shape of the frame. Some are made to government specs, meaning that they’ll look like the traditional weapons favored by law enforcement officers or the military. Others look simpler or even quite different and unique. The difference is largely aesthetic and totally up to you. Finally, make sure your frame’s size meshes with your other pieces and that it’s going to be a comfortable fit in your hand when all is said and done. A frame that’s too big for the other pieces is no good at all. There are three main types of 1911 frames you can choose from. We’ll overview these each individually so you can decide which you like the best for yourself. These frames are around 3.5 inches long and are usually considered to be “compact”. Most of the parts that fit onto an officer-style product can’t be interchanged with other frames due to the size difference. This kind takes smaller magazine sizes, but might be a really great pick for concealed carry if you have the proper permit. These are around 4.25 inches long from the barrel all the way through. It’s a little smaller than the government model and can take normal magazine sizes, as well as a lot of different attachments. Because of its size, it’s often considered an intermediate choice between officer and government frame types. These are 5” long, generally speaking, and their parts can be interchanged with commander-model frames. These take normal-sized magazines and can accommodate all of the attachments you might be considering. A lot of people like this style because it replicates the gun seen in pictures and movies most often. Now that we have all of the technical considerations memorized, let’s start looking at the best 1911 frames on the market today. The Caspian is a great example of a standard-issue government type of frame for a 1911. It’s built with a lot of great functionality, such as a heat treatment over its surface that will allow it to resist heat and shock beyond that of standard offerings. It can also be modified to be either cast from carbon or stainless steel. If you are allergic to certain metals, stainless steel is the way to go. It also has an accessory rail that makes setting up attachments or other modifiers very easy. This product is sized and machined with perfection to duplicate the look and feel of the classic, government-style frames that you can see in film or on real-life law enforcement officers. This is large enough that your gunsmith can set a tight slide at its top, permitting exceptional performance. The color is a bit bland, so if you like a darker finish you’ll likely want to put some paint on it before you start the integration process. Altogether, though, this is an excellent product that’s perfect for most customer 1911 builds or repair jobs. The government-style is most popular for a reason, after all! This is a great government-type frame that lets you choose between two types of finishes. It comes with a handy accessory rail for adding attachments later on. The Fusion frame is made in the commander-style, so it’s an intermediate between the lighter, smaller officer-type and the heavier, official government-type. 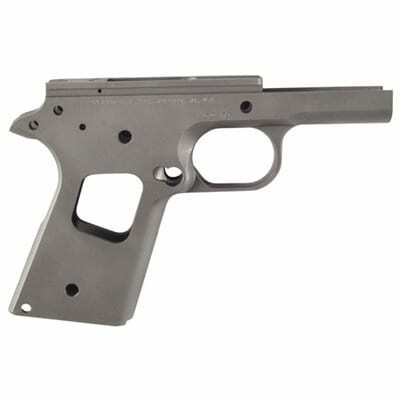 This item is machined from a solid bar and heat treated to permit excessive use and rapid firing without suffering any kind of a performance drop. It has a number of other features that make it worth your time and money. The thumb safety has been extended to improve quick switching, which is an important consideration in tactical shooting situations. There’s an undercut trigger guard and many of the screws and smaller pieces you need to finish installing this frame on a 1911 are already included in their places. This can rapidly speed up either a total 1911 build or a repair job, particularly if you are going from one type or size of frame to another. The price is a bit high, but the value you get out of the purchase is phenomenal. We feel that this frame is well worth the cost; it’s well-made and has a laundry list of great perks to make it worth your while. Although it’s a bit pricey, this commander frame has everything you need to finish installation right away. 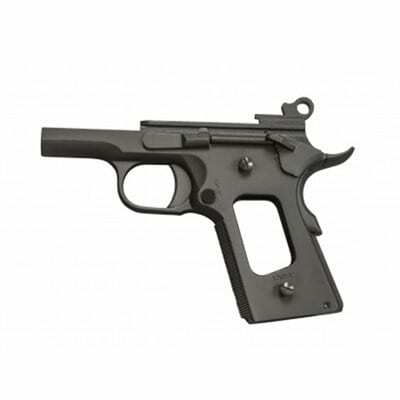 It comes with a number of extra features, such as a larger thumb safety and undercut trigger guard. The Brownells frame is a government model that looks as tough and capable as it really is. It’s all yours for a very decent price, too, lower than many other competitor offerings on the same marketplace. You can choose between carbon steel or stainless steel finishes depending on your preference or allergenic needs. Either way, it is heat-treated to extend its lifespan and performance even when you’re firing a lot of shots in a short period of time. The holes for screws have been precision-machined to make sure that any installation is trouble-free and as easy as possible. An oversized rail will allow a gunsmith to install a slide for a very tight fit, further improving your results once installation is complete. Due to its extreme precision-machining and durability, it’s highly recommended that you only install this frame with the help of a talented gunsmith. However, given all of the excellence it's sure to bestow upon your 1911, this is a minor flaw for a very affordable piece of equipment. 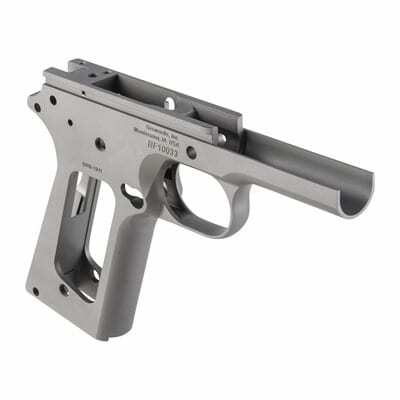 It’s an excellent, affordable option in the government-style with machined holes to promote easy installation with the precise help of a gunsmith. The rails are oversized to allow for a tight slide fit further in the process. The Caspian is an officer-type of frame, so this makes it among the smallest on our list. You’ll find that this type is great if you’re making a 1911 that you intend to conceal carry, as the smaller size will let it fit beneath clothes more effectively. It’s still quite durable and heat-treated to promote high performance as its used. You can pick between a carbon steel or stainless steel finish, but the color is a bit dull either way, so you’ll probably want to paint it at some point in the creation or repair process. The rails are oversized to allow for tight fitting of a slide once all the other necessary pieces are in place, and it’s all very affordable for your wallet, too. 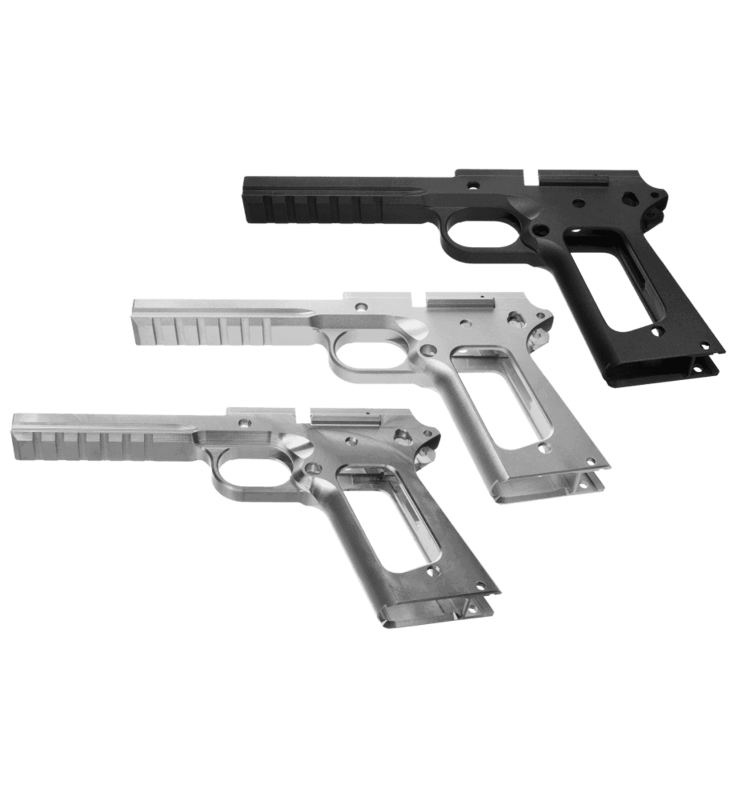 While officer frames aren’t as common as the other two styles, we feel that they have a definite place in the market and for a particular niche of 1911 users. If you find that an officer option is right for you, this is one of the best you can pick from any market. This is one of the best officer frames on the market. It’s affordable and you can choose between two types of finishes. The color will need to be painted over in most cases. This Fusion frame is an officer-type, just like the previous one we looked at. Whereas the last product was missing the screws necessary for completion, this frame includes the needed pieces with your purchase. This does drive the price up a bit, somewhat, but it might be worthwhile since it means you don’t have to track down those screws or look in your workshop. This product is finished with a matte black oxide, which helps protect the heat treatment it’s received. It is also sturdy and compact, with an undercut trigger guard and an extended safety that’s even more effective due to the overall smaller size. The safety is easier to reach than on a commander or government frame. Because of its put-together status, it’s perfect for completing a 1911 build or repairing a 1911 if you’re replacing another officer-type product. The fact that it comes with everything you need for the frame portion of a build is likely to save you time and money in the long run, which further justifies its cost in our eyes. This Fusion frame is a great example of an officer-style piece. It’s finished with a matte black oxide to promote style as well as preserve the function of the gun as it’s heated and used over time. It comes with all the screws and smaller pieces necessary to begin installation right away. With everything in this guide, you should be all set to finish your 1911 build or repair your tried-and-true sidearm. The right frame means everything to the operation and success of your gun, so make sure that you’ve taken your time and selected the right product before you begin gunsmithing. Thanks for reading!